The Nepenthe News is published the Friday following the Board meeting each month. It is a great resource for everything Nepenthe, including upcoming events, finances, important announcements from the Board and management, and committee meeting times and contact information. 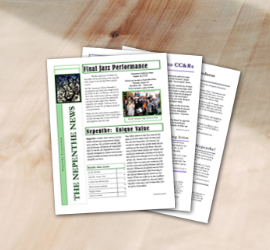 The newsletter is a collaborative effort of community members and management. *Go Paperless! Subscribe below to have it sent to your email the minute it's published. Are you interested in publishing an article in the Nepenthe News? Please remember that all article submissions are requests; we would love to put every article in the newsletter, but sometimes that is not possible. If your article doesn't make it into the current newsletter, we will try to put it in the next edition.